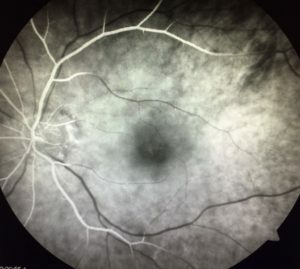 As with retinal vein occlusions, the branch artery occlusion involves a portion of the retina whereas the central artery occlusion involves the entire retina. Sudden, painless loss of vision are the most common symptoms of BRAO and CRAO. In branch retinal artery occlusions (BRAO), only a portion of the peripheral vision is lost and central vision may or may not be affected. There is more global loss of vision in cases of CRAO as the whole retina is involved, including the macula. Central vision is almost always lost except in patients who have an “extra” artery to supply the macula. If present, this cilio-retinal artery can actually save the central vision in patients with central retinal artery occlusion. Unlike vein occlusions where blood flow is stopped by compression, artery occlusions occur when a piece of cholesterol actually plugs the retinal artery. Blood flow is literally blocked as the cholesterol “plug” (called an embolus) plugs the retinal artery. Other types of plugs or emboli include blood clots/platelets or fat. Most commonly, cholesterol from the larger arteries in your neck are the culprit. A piece of cholesterol, breaks off and travels to your retina and occludes the blood flow. Diagnosis of an artery occlusion is generally made by your eye doctor and you may be referred to a retina specialist. A dilated eye exam is necessary to allow direct examination of your retina. There are characteristic findings of an artery occlusion. Often times it is possible to actually see the small piece of cholesterol plugging the retinal artery. This is called a Hollenhorst plaque. 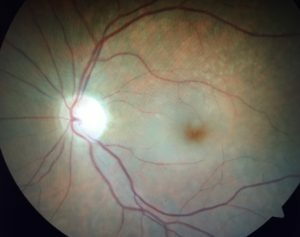 Additional testing with a fluorescein angiogram and an optical coherence tomography (OCT) can be very helpful to aiding in the diagnosis. We have both a fluorescein angiogram and an OCT in our Birch & Bristol office in Orange County. Vision loss is generally permanent in retinal artery occlusions. Unlike vein occlusions, there is little benefit to treating macular or retinal swelling. Treatment with steroids or anti-VEGF is usually not necessary. While there are treatments available for complications caused by a BRAO or CRAO (see below), there are presently no treatments for artery occlusions per se. Any disease which affects retinal blood flow can cause abnormal blood vessels (called neovascularization) to grow inside the eye. This is true of retinal artery occlusions. Left unchecked these blood vessels can cause a very painful type of glaucoma called neovascular glaucoma. It is very important follow up with your retina specialist to ensure this type of glaucoma is not developing. Laser treatment can be very helpful in preventing neovascular glaucoma from developing. Artery occlusions are essentially strokes of the eye. The same mechanism where cholesterol blocks blood flow in the retina occurs in the brain in most cases of stroke. It is very important to assess your risk of stroke. Your doctor may want to coordinate with your primary physician to get you evaluated for your risk of stroke.